Our next activity takes place place in the month of July. 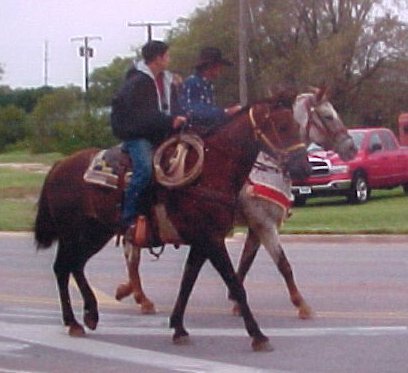 It starts out with a parade in Darrouzett, TX and then proceeds to Canadian, TX for the trail ride and their parade. The group meets in Darouzett, TX for the morning parade, usually on a Saturday. The parade in Canadian, TX takes place during their Fourth of July events. The day before the parade a wagon ride takes place from Lake Marvin, into Canadian at the rodeo grounds. The parade is in the morning, usually at 10:00 a.m. The group meets at the starting point and pulls the wagons as a group.